Cross shaft, dated to ninth century. 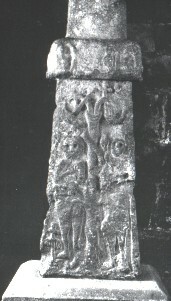 The shaft depicts Adam and Eve with the fruit bearing tree between them. There appears to be a serpent coiled around the trunk of the tree. Heighway, C.M., Anglo-Saxon Gloucestershire 1st, Alan Sutton, Gloucester (1987) Anglo-Saxons, Gloucestershire, England -- History..